The “German explorations” offer a chance to discover a representative scrutiny of authors, chosen not only for their individual and specific forms of expression, but also as emblematic figures to identify a panorama in the contemporary art culture. At present, German art is going through a vast internationalisation of its expressive languages; hence, these authors widen the view of this exhibitions series to a European scope. Opening Reception: March 23 at 6:00 p.m. When Colour Becomes Thought and Excites. Maria Wallenstål’s aesthetic heritage is now fully identifiable and accessible in Five Gallery exhibition space; the reserved and intimate nature of this environment allowed the installation of the works so that the visitors can engage with them in a personal and direct way and share their ode to joy, irony and pleasure, occasionally enthusiasm. Opening Reception: February 9 at 6:00 p.m.
Aldo Spoldi coins the Tallero Vascavolano „a little before the default of Lehmann Brothers and in advance on the crisis of the sovereign debt of our states“. As Lugano is an important financial hub, the exhibition is dedicated to the relationships which exist between art system and economic and financial system. The conformation of Five Gallery (which has competencies in art advisory and dealing) permits to show Aldo Spoldi's work. Professor in Brera, Aldo Spoldi proposes and launches the coniage of the Tallero Vascavolano, accompained by bonds and international monetary instruments. Through the emission of a new coin and thanks to his projects, models and essential tools, Aldo Spoldi tries to relaunch the encounter and the mediation which exists between art and earth culture, between the forms of sculpture and the value of water, between color and nature emotion. A portion of territory becomes the heritage on which the coniage of the Tallero will work and it will be the basis for future activities of the Accademia dello Scivolo in Bagnolo Cremasco (Cr). All the data that have been collected and reunited in Lugano will tell the birth and predispose the spread of the Tallero Vascavolano, being based on Aldo Spoldi's visionary creativity. He counts as a fundamental author of the Milanese culture from the Seventies to today. But his working team formed by Valentina Sonzogni, Angelo Galvani, Michele Ferrari and Marco Ermentini is playing an equally important role in the definition of his works. The press conference which will take place in Lugano on Saturday 3rd December at 4.30 PM should be a confrontation between the voice of aesthetics and the voice of finance. It should be a direct intervention within the social communication processes, with possible consequencies in behavioral processes. Opening Reception: 3 December from 4:00 p.m. The environmental rigor of the Gallery offers a sample perception and motivates the experience of aesthetics' preciousness, as an extreme result of a constant intellectual effort and an analytical inner sensitivity which is important in the definition of Lore Bert's works. The exhibition space allows the installation of a large cycle of works, which is the result of a careful selection through the vaste artistic heritage realized and collected in Lore Bert's atelier in Mainz. But it is also the result of a setting curated by the great German artist after visiting the gallery a few months ago. Nothing is left to chance: from the quality of every piece of work to the smallest watercolor, not to mention their relationship with the habitat, everything is the result of her rigorous and creative will. The display must be observed and experienced as a complete – not random – form of installation which has multiple aspects inside and is articulated according to plural experience of the expert artist. Lore Bert pays much attention to contemporary artistic movements, including international and cultural thoughts: from architecture culture to the depths of spiritual experience. Color and paper are the communication tools on which Lore Bert has built the dimension of her long working path, a tireless linguistic process dictated by increasingly detailed and specific studies. The paper, carefully selected and studied over history – from the material of papyrus to evanescence of rice – acquires centrality in the entire creative process with important characteristics, which are collected in a wide linguistic system: from installation to great dimensions, from tridimensional sculpture to precious watercolors – the poetic results of her long stay in Venice. Color in its pure essence defines the visual vocabulary of Lore Bert's entire work. In a field that is characterized by intimacy and sensitive perception, color goes deep through the sensitivity of watercolors, while on a grapich and plastic structure it affirms itself in works marked by desire for formal communication. Opening Reception: 13 October at 6:00 p.m.
Shendra Stucki’s collection of works expresses the various provocations induced by social relations through a creative nature that accepts to be compared with the chaos of the emotions. The result is rich expressiveness despite the extreme rigor of the composition and language. As the images of reality chase after each other with insistence and sometimes with obsession, so the entrance is enriched with an installation made of balloons which are witnesses of a will of lightening of the critic mass, but also of severe underline. The Abraham Sidney Ofei Nkansah’s work is the result of a narrative concentration conducted with such an insistent attention, fragment after fragment, sheet after sheet, to be placed in a close relationship between the ancient experience of medieval miniatures and the urgent, communicative-compulsive need of the contemporary time. No work is addressed by Abraham Sidney Ofei Nkansah without suffering and a personal, problematic heritage, until restricting image and narration in a state of absolute concentration. An accumulation of signs which results in a dense weave polychrome, mirror of an 'image of thought' that respond to an extraordinary aesthetic sensibility. Opening Reception: 9 June at 6:00 p.m. Presentation of the new edition of the magazine and collective show of the artists Susanna De Angelis Gardel, Francesco Maria Gamba, Giuli Gibelli, Mattia Maurizio, Bryn Marie Migliore, Camilla Parini, Paola Rezzonico, Shendra Stucki. Opening Reception: 19 April at 6:00 p.m.
Irene Dioli presents an extraordinary collection of watercolor studies on paper and works carried out in the reduced dimensions of the exercise and in larger dimensions characterized by an intense extension of color, capable of taking over the shadow designed by the figure, a recurrent subject in the work of the artist. A new cycle of works that brings together with her personal sensitivity the traces of breath, the fragment that remains after an emotion and that holds back and drags that evanescent and impalpable presence still alive in the geography and in the space of time. Christian Costa, a careful architect of a sculptural-design pathway dedicated to the iconography of the planet Earth, presents an innovative installation, through which he can transmit his personal thought and the ethical and artistic message, which has always characterized his work. A visual-literary event which can be enjoyed by the public, invited to take part not only in the perception of the work but also directly inside a planetary system, where written communication takes up a role that is active and equal to the one of the spherical form, affirming itself in the surrounding circular space. Opening Reception: 23 March at 6:00 p.m.
Saturday, 12 December 2015 on the occasion of Open Gallery#10 the gallery will be open from 2:00 to 8:00 p.m.
By observing the well-known historical-architectural forms of the Ticino and through a careful visual penetration into the austere sculptural structures of the Castelli that surround and characterize Bellinzona, Debora Fella has created a detailed and rigorous cycle of artworks. 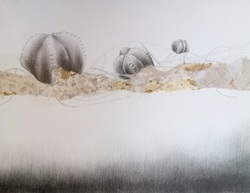 The expressive severity that characterizes and marks the different stages of her artistic path is consolidated in this cycle and finds an organic moment of internal connection, in line with the thematic turning point that aims at investigating and challenging the mnemonic substance of the architectural space. Opening Reception: 12 December at 6:00 p.m.
On thursday, 10th December 2015 at 6:00 p.m. will be held at the gallery the presentation of the precious jewels of art created by the historic brand founded by Ivo Misani, in a harmonious and original blend with contemporary artwork of the Five Gallery's artists. Five Gallery presents a captivating experience which investigates the relation between sculpture and architecture through the artworks of the Maestos Pietro Coletta (Italia, 1948), Vittorio Corsini (Italia, 1956), Antonio Ievolella (Italia, 1952) eHerbert Mehler (Germania, 1949). An exhibition in which the works of the participating artists express not only forms developed in space, complete of their own intimacy, but a combination of thematic forces and of interferences coming from different sensorial areas. Essential is the perception of the artwork - no longer isolated but contextualized in an environment that in this case is a private residential space. The objective is to create a situation that is not only expositional, but also, from a symbolic perspective, an objective form of interpretation of our existence: an “artist interior” transferrable to the connective tissues of our homes. Opening Reception: 15 October at 6:00 p.m.
Five Gallery presents a broad and inedited cycle of artworks by Maestro Giorgio Cattani from Ferrara dedicated to Herman Hess, to the reinterpretation of his writings and watercolors. The exhibition hands back the emotions and meditations that Cattani received coming into contact with his collection of paintings and the objects used by the same writer. The artworks and the installations originate from the careful study of letters and documents exchanged and collected, from the observation of the library and from numerous photographs that witnessed the everyday life and the social relations of Hesse, stored carefully in the Herman Hess Museum Foundation at Montagnola. As a continuation of the project promoting artworks tied to the territory, Carlo Alberto Rastelli carried out an in-depth study on the state of “nostalgia” when composing his creations. Very few people know that a Swiss doctor, Johannes Hofer, coined the term “nostalgia” as an illness found with greater intensity among his fellow citizens. Instead, the theme chosen by Riccardo Garolla is the state of “warning”, an emotion full of power and charged with aggressiveness hidden behind those photograms captured by the human mind when observing the surrounding landscape that the artist wanted to immortalize on his canvases. Opening Reception: 26 March at 6:00 p.m. The closing date of the exhibition Naturae by Valentina Sonzogni and Ilaria Forlini was postponed to 20 March 2015. The Gallery space hosts two distinct exhibitions that present a specific and thorough study dedicated to nature and to its landscapes, to the water systems and to the forest ecosystem, to the desert areas in which only the vegetable kingdom can survive. Two autonomous and unedited environmental sections allow the visitors to penetrate into this dimension, inducing a form of immersion inside the territory where silence reigns, offering an inedited condition of concentration to the visual enjoyment. Two artists have been called to carry out this project, Valentina Sonzogni, who re-interprets and transcribes the trail of Lake Ceresio and the patterns of Mount Brè and Mount San Salvatore; Ilaria Forlini, who perceives the desert scenes with the appearance of sudden blossoms. Opening Reception: 12 February at 6:00 p.m. Following the resounding success of Caleidoscopio del contemporaneo, the closing date of the exhibition will be postponed to 7 February 2015. On the occasion of the Holy Christmas 2014, Five Gallery proposes to its collectors an assortment of precious drawings of small and medium sizes, made specifically by the artists represented and with prices ranging from 100 to 350 Francs. An original gift that gives those who receive it the opportunity to approach the art world and enrich one’s cultural knowledge, in addition to making the first step towards the creation of one’s own art collection. FIVE GALLERY WISHES YOU A MERRY CHRISTMAS! Ilaria Forlini, Studio per Astrophytum Myriostigma, mixed media, 18x13 cm, 2014. The gallery will be open to the public on Sunday 7 December 2014 from 2:00 to 6:00 p.m..
On view Caleidoscopio del contemporaneo, Famous Maestros of the second avant-garde and Young Talents of the last expressive season. During this event, the installation of Emiliano Rubinacci, La rivolta dei carrelli, will be showing at the entrance of the gallery in via Canova. With 'Caleidoscopio del contemporaneo’, Five Gallery inaugurates a new exhibition season characterized by the will to put itself in harmony with the current state of art and follow a path that aims at reaffirming the principle of Collection of Contemporary Art. Opening Reception: 25 November at 6:00 p.m.
On Monday, 27 October 2014 at 6:00 p.m. the photographic competition award Arte e Femminilità (Art and Femininity) will take place at Five Gallery organized by OtherMovie Lugano Film Festival in collaboration with Mag. The projection of the photos of the finalists will follow and a cocktail will close the evening. Finissage with the artist: Friday 24 October from 6:00 p.m.
Five Gallery announces its participation for the second consecutive year in Art Verona, prestigious modern and contemporary art fair that will take place 9-13 October at the Verona trade show district. The gallery will be open to the public on Sunday, 6 July 2014, from 3:00 to 8:00 p.m.
On view Shendra Stucki: un mondo invaso da colori ed elettricità and some of the most significant art works of the Five Gallery collection. Five Gallery inaugurates the project La settimana dell'artista (The week of the Artist) on view Tuesday 1 July through 14 September 2014. Five Gallery is glad to announce its participation in the Scope Basel 2014 fair! On the occasion of the show L'OCCHIO, L'OBIETTIVO E IL MONDO (The Human Eye, the Lens and the World), the public will be have the opportunity to attend the preview and see the works of those artists selected by the gallery for the prestigious international art fair that will be held at Basel from 17 to 22 June. Collective show carried out in collaboration with the artists of MAG: magazine. Through “L’occhio, l’obiettivo e il mondo” (The human eye, the lens and the world) Five Gallery traces an authentic path that starts from the power of seeing, one of the five senses given to man, up to the perception of reality inevitably filtered by personal interpretations or, why not, by the lens of a photographic camera.